Click the Modify tab in the file manager. 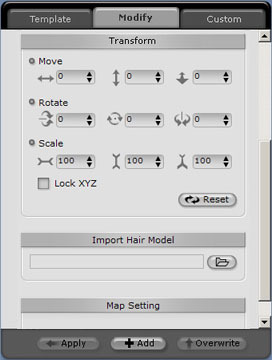 Use the Transform controls to Move, Rotate or Scale the hair. Check Lock XYZ check box to keep the proportion while scaling the hair model. Press the Reset button to restore the original transformation of the hair. Hair can be moved left/right, up/down, or backwards/forwards. It can also be rotated left/right, tilted forward/back, or rotated clockwise/counter-clockwise around the face of your character. The Scale control changes the width, height, or depth of the hairstyle. If you want to save the result for later use, click the Add button to add the hair style to the Custom tab library.